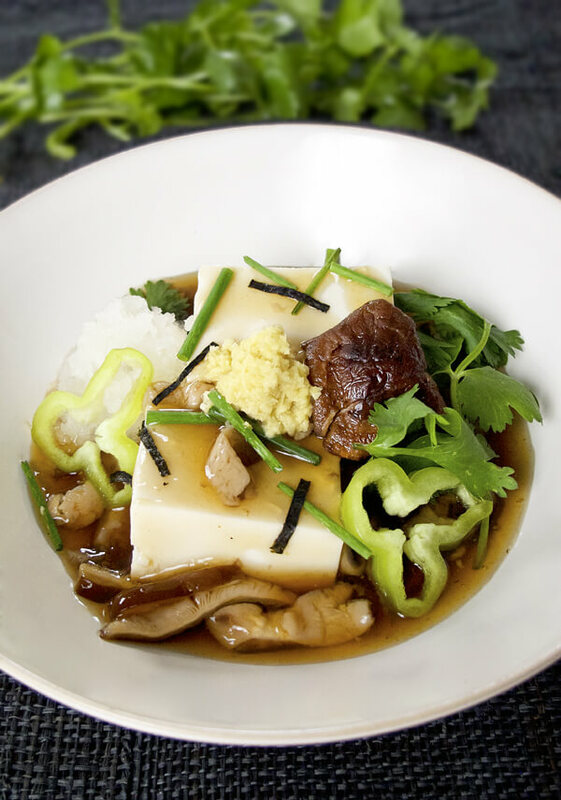 Traditional Japanese flavors mixed with a little Chinese flair makes this tofu dish unforgettable. What do you do when you have silken tofu nearing its expiration date and two packs of shiitake mushrooms begging to be used? Make something Asian that’s healthy, vegetarian and delicious! Especially after a couple of days of indulging on cured meats, creamy cheeses (I’m such a camembert fan!) and pates, it was time to get back on the low fat, feel good train. Make your own work of art with these colorful and healthy toppings. Healthy and vegetarian doesn’t have to mean bland and boring. For centuries, Asian cuisine has done a great job at catering to vegetarians with mouthwatering dishes that are delightful and complex in flavor. Whenever I think of cooking food that is predominantly meatless, my mind goes straight to Asia. 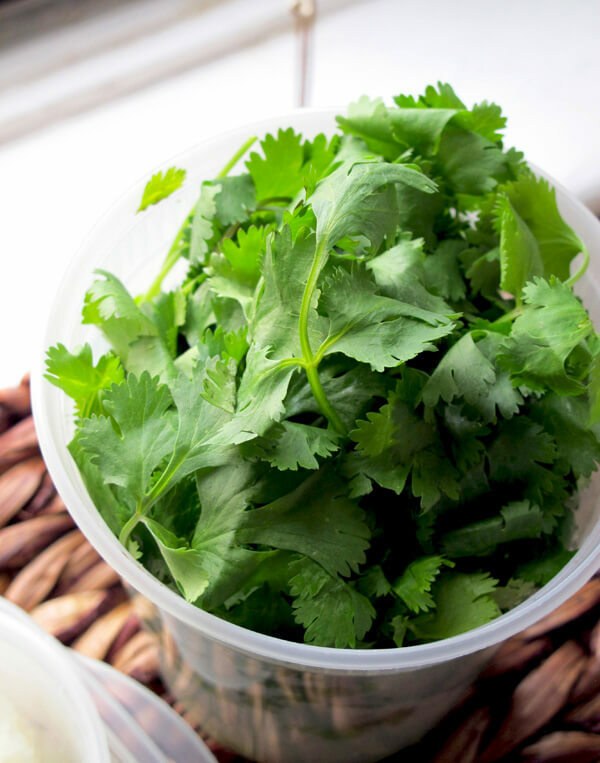 Fresh cilantro brightens up the dish. Make sure to thoroughly rinse as cilantro is notorious for being very sandy! A dish like this tofu with mushroom sauce will satisfy the carnivore in you because it’s filling, has a rich and meaty texture (from the shiitake mushrooms), yet is low in calories and fat. 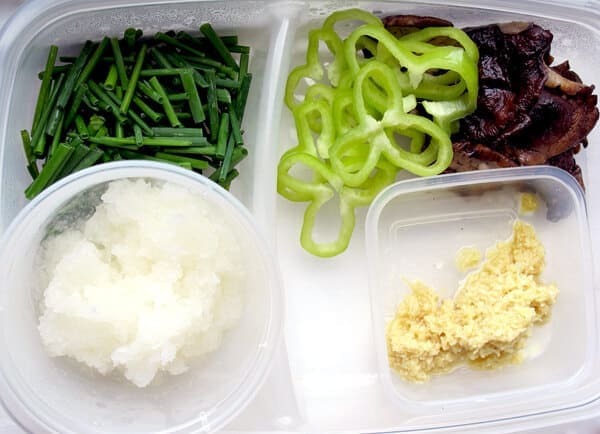 Toppings are arbitrary; you can really add anything to this dish that you like, though the addition of grated daikon and ginger invigorates and spices up this otherwise mellow tasting dish (earthy, slightly sweet with savory notes). 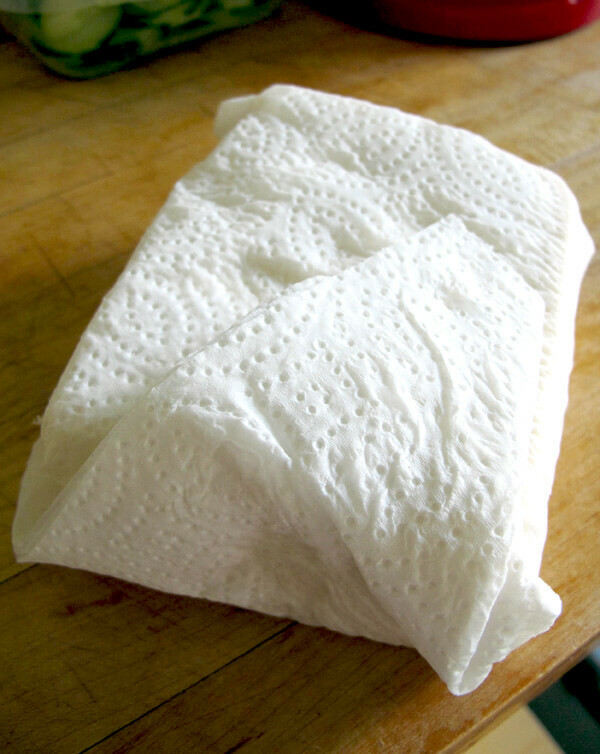 Wrapping tofu in paper towel a few times helps remove excess water. You can also use a regular tea towel to be environmentally friendly. We had the dish on its own for lunch (with a glass of mugicha) and it was scrumptious! The following day I served the leftovers for dinner, alongside spaghetti vongole and that didn’t turn out so well. The strong flavors of the vongole completely upstaged the delicateness of the tofu with mushroom sauce. My advice: Either serve this as an appetizer alone (for full WOW! effect) or with something mild like a steamed fish, tsukune or a bowl of rice with pickles on the side. You can use dried or fresh shiitake mushrooms. If you are using dried, rehydrate them before adding to the sauce. This tofu with mushroom sauce recipe will remind you of tofu served at kaiseki dinners (traditional multi-course Japanese dinner) with a splash of Chinese influence. It might just become your favorite tofu dish; believe me, it’s that good! A little katakuriko (potato starch) goes a long way! 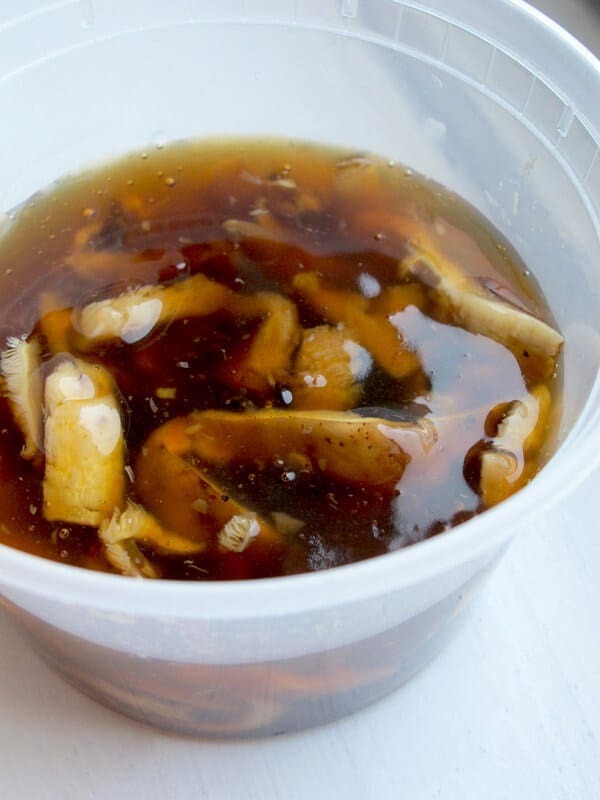 Less than a tablespoon is added to this mushroom sauce to give it thickness. NOTE: Katakuriko (potato starch) can be found in most Japanese and other Asian supermarkets, or can be ordered through Amazon. 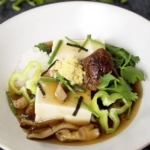 Silken tofu in a mushrooms, soy, mirin broth topped with grated ginger and chives. A fancy and delightful tofu recipe! – Drain and wrap tofu in a few sheets of paper towel (or cloth, tea towel) for a few minutes to remove excess water. Repeat 5 times. – Slice tofu into 8 small blocks. Set aside. 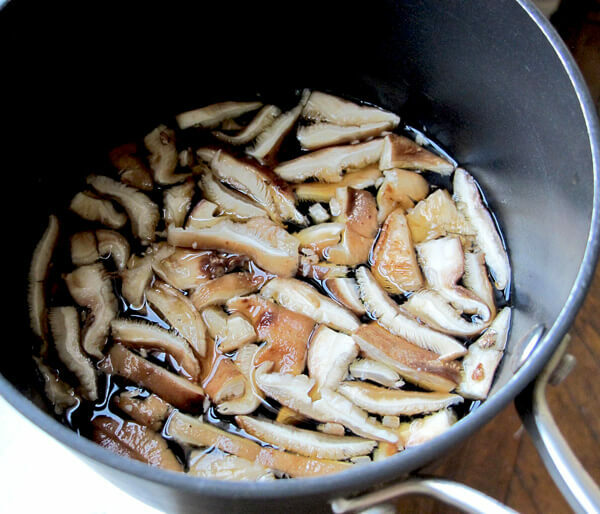 – In a small pan over high heat combine dashi, light soy, soy, mirin and mushrooms. Bring to a boil and add potato starch mixed with water. Stir and lower heat. Keep stirring until sauce thickens – this shouldn’t take more than a minute or two. – Turn the heat off. – Divide all the ingredients into 4 shallow bowls with tofu in the center. – Equally pour mushroom sauce around tofu and top with a little nori. Serves 4 appetizer size bowls. Add a little ichimi pepper for heat.